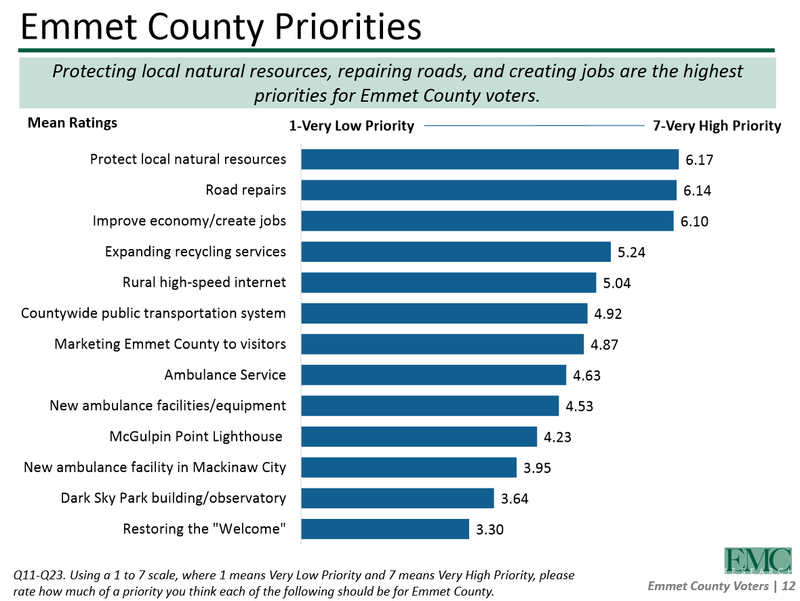 Emmet County commissioners are apparently out of touch with the electorate. At the 1 p.m. meeting, the road commissioners pleaded their case for additional money, followed by a presentation by the parks and recreation department expressing their desire for facilities, mostly at the Headlands. Still, with the public’s lack of an agenda, a bond counsel and a financial advisor then began talking about bonds. But this happened a year ago, right? The self importance of the commissioners must surely be justified as a recent survey shows them as performing better than 50% OK! in the eyes of the constituents. The transportation and ambulance service survey had some other parts to it that were interesting indeed. Especially given the impetus to serve higher taxes on a dark sky platform. Oops. Of course ‘tourism’ is tops! Oh wait. no it was not. The disconnect should not surprise anyone who has lived in the hinterlands for more than a decade. The progressive disease of both urbanizing into tight squalid sectors and limiting access to private property owners in all others has been on a major push in that time. We’ve seen it arrive, infest our leadership, and make our individual property and financial priorities subject to the whim of zealous spenders and takers. This should be a reminder of why you need to attend this forum. Does anyone happen to know how this got around OMA requirements? Probably the same way that similar crap gets around it in my hometown of Kentwood: Unless it's one of the nine things required to be listed separately on the City Commission's regular order of business, then it's placed on the Consent Agenda, which consists of everything decided upon by the Committee of the Whole meeting conducted immediately prior to the commission meeting. The COW (consisting of the Mayor, the Commissioners, the Department Heads, and the Committee Chairs) is open to the public, but is damn near never attended by the public. The entire Consent Agenda appears early in the commission meeting -- fourth item on the regular order of business -- and, unless any commissioner objects to a specific item, is enacted on a single roll call vote. Thus, the appearance of OMA compliance is preserved, and the low-information public is none-the-damn-wiser. And yes, this practice has become a prominent talking point in my campaign to unseat Sharon Brinks' handpicked replacement. "The same type of thinking that drives the nonsense in DC" is always developed at a lesser level. Congress-critters and state legislators learn their bad habits somewhere, and without fail it's learned by getting away with this monkey business at the local level (school boards, municipal councils, county commissions, etc.). This is the tea party's epic fail: It's all well and good to raise hell with the elected turds in Lansing and DC, but if we're not paper training them in our own backyards, then we're merely guaranteeing that our right to the pursuit of happiness will be pilfered by those who have the most power to do so. Politics is, in fact, local . . . always. If I didn't know for a fact that isn't used in this corner of Michigan (at least in the Tri-County area anyway), I would've asked if they learned this from the Kilpatrick School of Public Administration. That family has dirty pool down to an art form. Thank you, Jason, for putting this post together. Ooops, didn't include the link, did I?